Tests from the Donegal Mountain Rescue Team will help shape EU regulations. Mt. 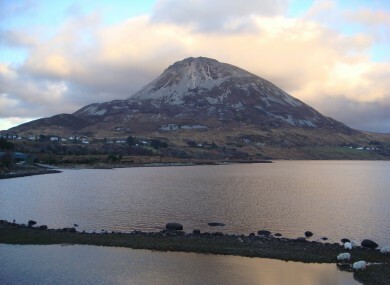 Errigal, one of the mountainous areas in Donegal. DONEGAL WILL BE at the centre of a pilot scheme which will help shape the rules regarding drone usage among emergency response teams. Both the European Emergency Number Association (EENA), an NGO dedicated to improving emergency services, and drone company DJI announced a partnership which would see it training first responders to use drones in emergency situations. One of the two groups taking part in this trial is the Donegal Mountain Rescue Team, a organisation made up of volunteers across the county. Team member, Leo Murray, said the organisation had been testing drones for the “past nine months” conducting tests, but the new partnership allows further testing over the summer. “The announcement [from EENA and DJI] was on the back of the relationships we’ve built up,” he said. “DJI and EENA have come on board toe be part of a pilot test for the summer because they’re putting together compliance and regulations of drone applications in emergency services and they want to see the best way of doing it”. We’ve been at it for about nine months testing it and we’ve had positive results but there are further tests needed over the summer. Since the volunteer organisation has experience in drone usage, partly thanks to a Donegal startup called Drone App Labs developing some of the software needed for live feeds and tracking, the pilot scheme will look at developing networking and crowd-sourcing capabilities. That’s something the rescue team already does as it regularly works with the Irish coastguards’ ground-based teams and boat units since some of the mountainous areas are based along the coastline. Roughly 40% of its calls are coastline based according to Murray so it makes sense to expand upon this. “We would be looking at doing trials with them as we know they’re interested as well,” says Murray. “So you’re looking at cliff areas, bays and areas that are inaccessible or hard to get to so that’s where we see the application”. The main objective of a drone is to enhance the personal view and get a visual overview in advance of the team actually reaching it… we can get a drone to send back live imagery. We would be able to asses that imagery and inform the different search parties to go to different areas. A live view of remote or hard to reach areas is one of the things drones can be used for, but the team is experimenting with other uses. One would be dropping payloads to someone remotely to help them out while another area they’re looking at is thermal imagery, giving it the ability to perform night searches using heat signals to find people. Overall, such a scheme allows the organisation to further step up their tests and see where their strengths lie. Yet they’re not seen as a replacement for anything, just as a way to compliment existing protocol. “It’s really just an extra tool in the toolbox,” says Murray. We are thankful [for the pilot scheme] because we are voluntary and we don’t have money to buy this equipment… it’s an opportunity for us to use and get the benefits of them”. I do see their use coming into emergency services just because we can get live imagery for remote locations very quickly… [and] speed up search and rescue operations. Email “How Donegal Mountain Rescue Team is using drones to save people”. Feedback on “How Donegal Mountain Rescue Team is using drones to save people”.